Unless you’ve been living under a rock, you probably know that British royal couple Prince William and Kate Middleton were married this morning at Westminster Abbey. The ceremony, of course, was lovely and plenty of celebrities (including Posh and Becks) were on the scene, but let’s get to the part we Ecouterreans really want to talk about: Kate Middelton’s royal wedding dress! The new Mrs. Windsor looked beautiful in a lace-sleeved, classic white wedding gown that had more than a few nods to fellow princess Grace Kelly’s wedding dress. The double-super-secret designer? Sarah Burton, who was assistant and protege to iconic British fashion designer Alexander McQueen for many years and now helms the brand. We were particularly excited about the quintessentially British details we spied, including locally hand-embroidered tulle and needlework. The royal gown comprised ivory and white satin gazar (a loosely woven silk), English and French Chantilly lace, and a train that measured a staggering nine feet. In classic McQueen fashion, the Victorian-inspired ivory satin bodice is pinched at the waist, creating an even more flattering effect on Middleton’s already flawless figure. The skirt’s floral design incorporated the rose of England, thistle of Scotland, daffodil of Wales, and shamrock of Ireland. But what really interested us was the handiwork that went into the ensemble. Handmade by a team at the Royal School of Needlework, the skirt bloomed with a hand-cut floral design that incorporated the symbolic rose of England, thistle of Scotland, daffodil of Wales, and shamrock of Ireland. The flowing veil, which consisted of layers of ivory silk tulle, was also trimmed with a trail of hand-embroidered flowers. Holding it in place was the hand-me-down of hand-me-downs: A 1930s Cartier halo tiara from Queen Elizabeth II, who in turn inherited it from her mother when she was still Princess Elizabeth. Finishing off the look were, of course, the shoes. A team at Alexander McQueen clad the royal footwear in ivory duchesse satin and hand-embroidered lace from the Royal School of Needlework. 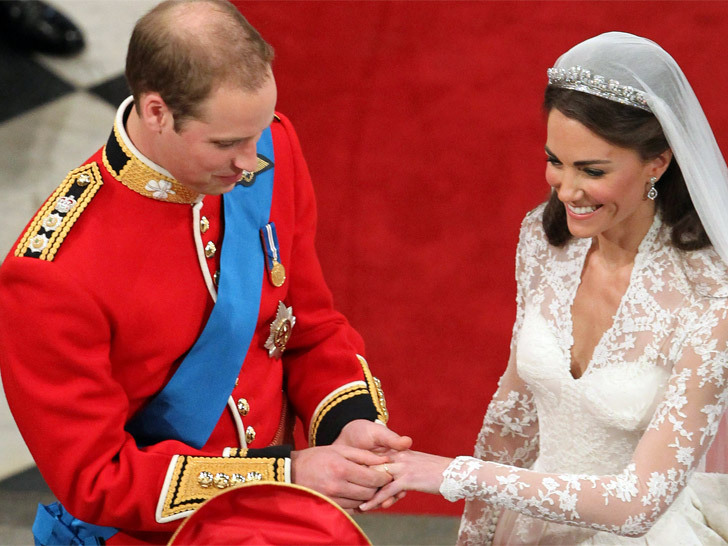 Unless you've been living under a rock, you probably know that British royal couple Prince William and Kate Middleton were married this morning at Westminster Abbey. 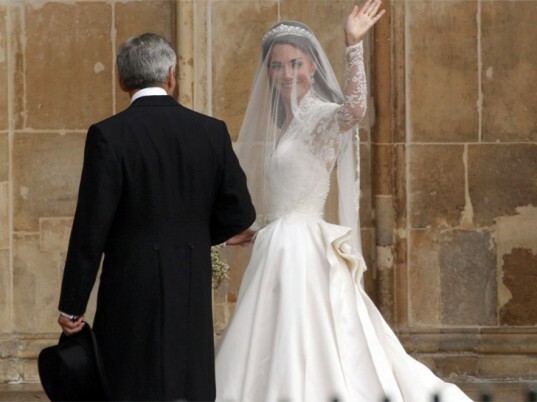 The ceremony, of course, was lovely and plenty of celebrities (including Posh and Becks) were on the scene, but let's get to the part we Ecouterreans really want to talk about: Kate Middelton's royal wedding dress! The new Mrs. Windsor looked beautiful in a lace-sleeved, classic white wedding gown that had more than a few nods to fellow princess Grace Kelly's wedding dress. The double-super-secret designer? Sarah Burton, who was assistant and protege to iconic British fashion designer Alexander McQueen for many years and now helms the brand. We were particularly excited about the quintessentially British details we spied, including locally hand-embroidered tulle and needlework. Prince Charles and Duchess Camilla Parker-Bowles.